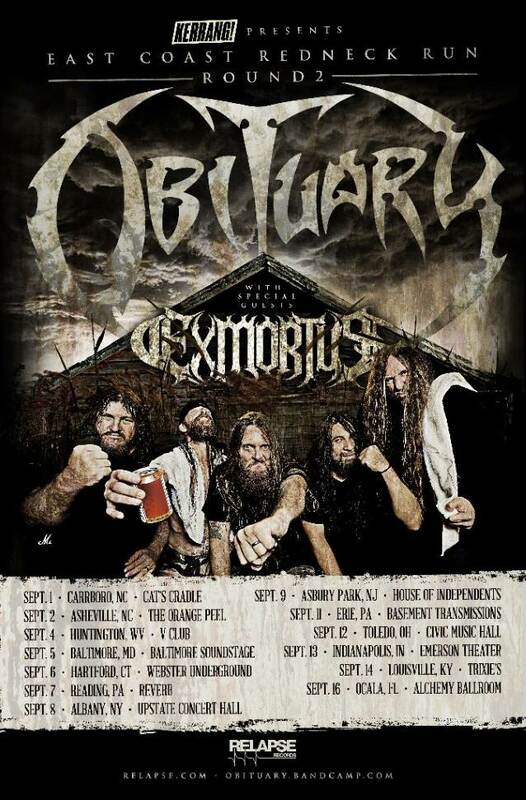 Florida death metal legends OBITUARY will embark on a U.S. tour next month. The headlining East Coast run, with support from EXMORTUS, begins September 1 in Carrboro, North Carolina and ends September 16 in Ocala, Florida. OBITUARY will head to Europe in November to perform with SLAYER, LAMB OF GOD and ANTHRAX on a 24-date tour. OBITUARY recently announced a reissue of 2017’s self-titled full-length release, featuring two bonus tracks not included on the original pressing and alternate artwork. The band will also release the first official vinyl pressing of the “Ten Thousand Ways To Die” EP, featuring live recordings of 12 classics and fan favorites from the band’s storied catalog recorded on the 2015 world tour. The limited-edition OBITUARY vinyl is due out August 31 on Relapse Records. OBITUARY‘s second Relapse release — the aforementioned self-titled tenth studio album — came out in March 2017.